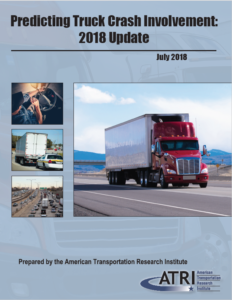 Phoenix, AZ – The American Transportation Research Institute (ATRI), the trucking industry’s not-for-profit research organization, has just released the update to its renowned Crash Predictor Model, which statistically quantifies the likelihood of future crash involvement based on specific truck driving behaviors (e.g. prior crashes, violations and convictions). ATRI’s analysis draws on data from over 435,000 U.S. truck drivers over a two-year time frame to expose nearly a dozen behaviors that raise a driver’s risk of being involved in a future truck crash by more than 50 percent. Understanding that traffic enforcement, particularly those activities that target the crash predictor behaviors, is an effective tool for mitigating crashes, ATRI’s research quantifies the “top tier” states which emphasizes those states that have proven track records of maximizing their enforcement resources while minimizing their share of the nation’s truck crashes. Arizona was ranked eight overall in ATRI’s report. A copy of this report is available from ATRI at www.truckingresearch.org.